Small and medium enterprises feel the pinch, but find ways to sustain themselves and grow. Some sections of India's business community may be reeling under the impact of the economic slowdown, but small and medium enterprises (SMEs) are swimming successfully against the tide. Take, for instance, Ganesha Ecosphere, one of the winners of Business Today-YES Bank SME Awards this year. With 100 per cent growth in net profits - to Rs 18 crore - 2010/11 has been the best year in the company's history. It continues to see robust demand for its product - recycled polyester staple fibre from waste PET bottles. Multiple examples across the country bolster the view that smaller companies - though most vulnerable to macroeconomic challenges - are displaying both flexibility and resilience. 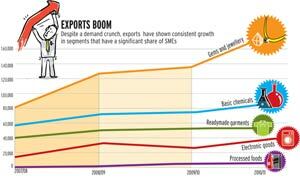 The SME sector has over the years registered faster growth than the gross domestic product (GDP). While GDP grew 6.7 per cent in 2008/09 and eight per cent in 2009/10, the SME sector clocked 11.4 per cent and 11.6 per cent growth, respectively. "We expect eight per cent growth in 2011 despite tough macroeconomic conditions," says H.P. Kumar, Chairman, National Small Industries Corporation (NSIC). An estimated 26 million SMEs in India employ a whopping 60 million people. They contribute 45 per cent of the country's manufactured output and 40 per cent of its exports. "While the contribution to GDP remains 17 per cent, it is expected to touch 22 per cent by 2012 because of investments in technology upgradation," says industry body ASSOCHAM in a report. In 2011, while larger companies put expansion plans on hold, the larger among SMEs continued to invest. Take, for instance, Dhar, Madhya Pradesh-based Flexituff International, a manufacturer and exporter of jumbo bags used for packing and transporting powdered and granulated material. Flexituff earned revenues of Rs 580 crore during 2010/11, a jump of Rs 320 crore from 2009/10. It raised Rs 104 crore from its IPO last October, of which Rs 28 crore has gone into capacity expansion. "We are confident of surpassing our target of adding Rs 200 crore to our turnover closing March 2012," says Saurabh Kalani, Chief Operating Officer, Flexituff. This is despite suffering a 10 per cent dent in demand in international markets. When demand in Europe started slackening, Flexituff ventured into other regions such as Japan, West Asia and Australia. Adds Ramesh Sabnis, Vice President (Operations), Maharashtra-based auto components maker Menon and Menon: "We went for 50 per cent capacity expansion because of increasing demand from clients like M&M and John Deere." Growth and expansion are also bolstered by the fact that flow of funds to the sector has not slowed down. Says M.K. Nag, Chief General Manger for SME at State Bank of India: "While borrowing by the sector increased by 25 per cent during 2010/11, that for 2011/12 is expected to increase by 20 per cent." What is hurting, though, is the cost of money. Typically, SMEs borrow at a higher rate than larger companies - 11 to 13 per cent against eight to 10 per cent. This year, borrowing rates for SMEs are as high as 15 per cent. Says Vijay Gujrathi, CEO of AZ Electronics, a Pune-based supplier of UPS systems and battery chargers: "We borrowed from Canara Bank at 11.5 per cent in January and at 14.4 per cent in November. We had no choice; when banks increase their rates, open market rates rise higher." Rising raw material and labour costs have also taken their toll. For a manufacturing unit, raw materials make up 60 to 65 per cent of total costs. "This has summarily affected the overall cost of doing business by 10 to 15 per cent," says Sachin Nigam, Director (SME Ratings), CRISIL. Says NSIC's Kumar: "Living expenditure in cities is rising; also labour, which had no work in the villages earlier, now prefers to stay there because of the employment opportunities offered by the National Rural Employment Guarantee Scheme." Faridabad-based Sampark Logistics, which provides logistics services to M&M and Tata Motors, has been hit by rising fuel prices, but is unable to increase service rates. "We have been controlling costs by cutting down employee travel," says Sanjay Raina, Corporate Business Head, Sampark. Then, delayed payments from large companies, which are themselves under pressure, have resulted in inventories piling up and working capital getting blocked. "That was a disturbing trend throughout the year," says Amarendra Sinha, Development Commissioner, Ministry of MSME. "Liquidity problem is getting acute," says Sushil Kumar Gupta of Laghu Udyog Bharti, who also runs his own unit Fastener's India in Bareilly, UP. "The average receivables cycle was 90 days, which has stretched to 110-120 days or more." The good news is that despite the odds, SMEs are not throwing in the towel. Last November, after six years of deliberation, the government pushed through a policy that makes it mandatory for government bodies and PSUs to increase procurement from micro and small enterprises to 20 per cent of their requirements within three years. NSIC estimates this will directly impact 20,000 units, and open up business opportunities worth Rs 50,000 crore within three years. The government will also set up a Rs 100-crore Defence Technology Fund, as part of the defence production policy, which will fund the R&D projects from the SME sector. Sinha of the Ministry of MSME is positive about 2012. "The RBI, in December, already signalled easing of monetary policy," he says. "I see things stabilising by the first quarter and improving by the second quarter. This will also depend on externalities. I hope nothing dramatic happens in the US and Europe."